When Kaderin the Cold Hearted lost her two beloved sisters to a vampire attack long ago, a benevolent force deadened her sorrow—accidentally extinguishing all of her emotions. Yet whenever she encounters Sebastian, her feelings—particularly lust—emerge multiplied. For the first time, she’s unable to complete a kill. The prize of the month-long contest is powerful enough to change history, and Kaderin will do anything to win it for her sisters. Wanting only to win her, forever, Sebastian competes as well, taking every opportunity–as they travel to ancient tombs and through catacombs, seeking relics around the world–to use her new feelings to seduce her. But when forced to choose between the vampire she’s falling for and reuniting her family, how can Kaderin live without either? Picking up just after the end of the previous book, A Hunger Like No Other, this story opens with Valkyrie Kaderin the Cold-Hearted hesitating to kill a vampire. Something that she hasn’t done in over a thousand years. But as she looks into the eyes of the once-human-turned-vampire, Sebastian Wroth, she sees something more than vampire. Within minutes, Sebastian’s heart is beating and both realize that Kaderin is Sebastian’s destined Bride. Desire overtakes Kaderin – the first feelings she has experienced since the death of her sisters a millennia ago. Ashamed by her lustful indiscretion with Sebastian, Kaderin quickly leaves and heads for her London flat to prepare for the Talisman’s Hie, a “deadly, immortal version of The Amazing Race.” Kaderin is reigning champ 5-times running. Upon arriving at the games, she is shocked to see Sebastian. He also enters the competition with hopes of wooing Kaderin. The two begin a love-hate relationship, working their way through the challenges of the Hie. The third installment of the IAD Series is an action-filled roller coaster ride! With the setting of a deadly immortal adventure game, this story has a quick pace and full of intense action. 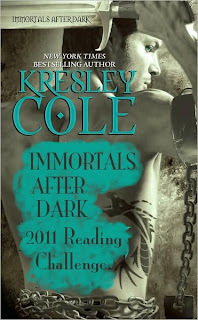 Having so many paranormal species together also gives the reader further insight into Ms. Cole’s exciting world. At the heart of the story are Sebastian and Kaderin. He is one of the long-lost warrior brothers of Myst’s husband, Nikolai (“Warlord Wants Forever”). She is a cold-hearted Vampire assassin who has been “blessed” with a curse that leaves her void of all emotion. Their initial meeting right at the start of the book set the stage for a powerful attraction and romance. I enjoyed the “lust at first sight” aspect – that they were destined to be, but then the couple took time finding their way. The development of their relationship and love was well paced. They both had much to overcome: her fears, his frustrations, so the pace of their connection seems “natural” for a paranormal setting. They had many “little moments” that made my heart leap or my eyes tear up. One of the things I like about Ms. Cole’s mythology is that it isn’t a “good” thing when your destined mate is from a different paranormal species. The fact that both Myst (first story) and Kaderin have to overcome ridicule and embarrassment, and that they are willing to do that once they realize that they are in love, creates an added dimension to the story lines. Kaderin is conflicted, and how she deals with it is well played out. I shed a tear or two as I read this book. The action in this book made for a fast-paced story. I loved the humor and bits of lore presented during the Hie competition. I am very interested in where the overall story is going – especially what will happen to Bowen. Oh I loved this one. I’ve loved almost all of them but this one was awesome!! Makes me want to go back and re-read the series.